Players drive their car around. R - play without soccer balls. Players crawl through legs of frozen players to free them. -Aliens and Astronauts. Aliens (blue) will "shoot" the ball at the Astronauts (white) using correct shooting technique. -If an astronaut is hit below the knees with a ball, he quickly gets a ball and becomes an alien. 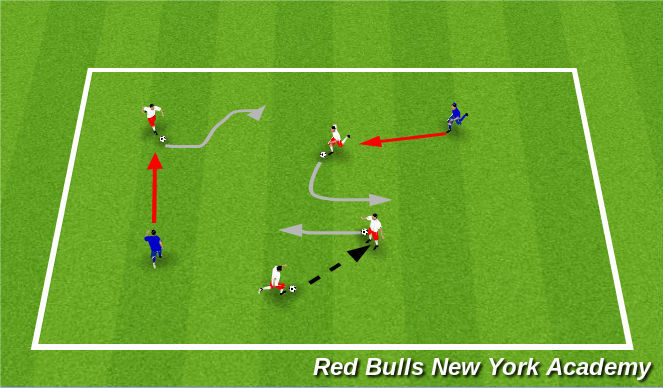 Organization: - Establish a 5-yard open space between the paired players. Each pair needs 1 soccer ball. 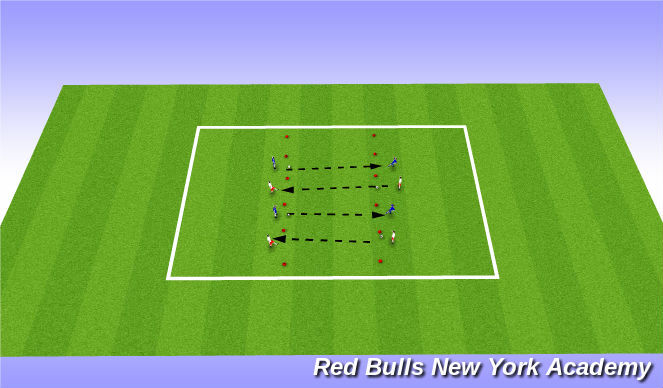 Instructions: - Players pass the ball to each other ensuring it does not stop in the dead zone. (1). Angle of approach – center. (2). Supporting foot is next to the ball pointed at target. (3). Contact ball - middle. (4). Contact foot - inside. (5). Ankle locked with toe pointed up. (6). Follow through towards target with striking foot remaining open throughout. Progressions: (1). Use both feet. Keep the ball moving and don&apos;t let it stop in the dead zone. (2). Keep ball moving by pushing the ball across the body or to the side of the body so the ball doesn&apos;t stop. (3). Have the players use the "weak" foot only to increase accuracy and familiarity. Organization: 40 x 40 yd area. -7 gates- 2 yd wide. Instructions: Passing through the bridge with inside of the foot only. Ball must be passed on the bridge between partners. Each pair passes on the same bridge and count how many passes in a row between cones. Do not let your ball fly off the bridge and drown in the river. (2). Head is looking in the direction of the pass. Progressions: (1). Each pair has 1 bridge and pass through the gate without hitting railings (cones) as many times in a row for 2 minutes. (2). Now, partners count how many bridges their ball crossed and can NOT use the same bridge twice or else will have to pay a toll (-1 bridge). (4). Ball crosses as many bridges without touching the railings. If your ball goes off of the bridge when you pass, you are OUT. Last team standing wins! 1. 2 players will play against each other and try to knock the ball off the center cone with a pass. 2. Player 1 will start the game and try first. If the player knocks the ball off, he gets a point. 3. Then the player places the ball back on the center cone and player 2 attempts.